Jacob specializes in retail with a focus on leasing and investment sales. 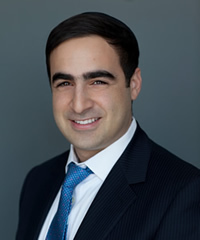 As a member of Houman Mahboubi’s team, Jacob works closely with Developers, Landlords, and Investors helping them achieve their specific real estate goals and objectives. Prior to joining BRC Advisors, Jacob began his career at Prime Opportunities Investment Company working beside the Chief Investment Advisor in Beverly Hills, CA. In this role he provided analytics and market research to achieve substantial risk-adjusted returns fort clients while analyzing the long-term trajectory of the worldwide economy. Leveraging this experience, Jacob provides unique and creative solutions to the challenges faced by many developers and investors. He takes pride in actively supporting his community and helps various Jewish charity organizations. Jacob attended Bellevue University while he was pursing his master’s in Business Administration.